When mechanical engineering sophomore Uyen Nguyen started the origami club at Cooper Union last year, she was hoping to create a place where the art of paper folding could unite students from art, architecture and engineering. Ms. Nguyen, who has been folding origami since before she started kindergarten, describes the art form as "a combination of math and art. You can use it to do mathematical proofs, as well as to make something that is aesthetically pleasing." Corinna Lupp, an art student and club member, agrees. She describes it as "a great opportunity to meet with students from the other schools and learn a skill which i’ve used in my own projects." A number of technological developments have come from insights distilled from the principles of origami. These range from the deployment of automobile airbags to the design of solar sails. The art of paper folding that emerged in 17th century Japan has proved particularly suited at offering complex and modular solutions to problems of compacting and structuring space and material. When the Cooper Union origami club first started meeting in September, 2011, members would work on independent projects and share design knowledge and discoveries. Quickly, the group surpassed these simple endeavors and started working on modular pieces that would require group effort to produce larger, more ambitious works. When questions about who would keep the pieces that were collectively constructed came up, Ms. Nguyen suggested to the group that each project should be given away as a gift on its completion to someone outside the club. When the group decided to make a five intersecting tetrahedra, they chose the colors of the Cooper Union logo for the piece. 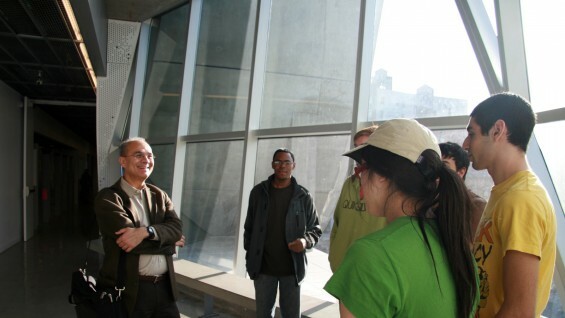 After the tetrahedron was completed, the group presented the work to Jamshed Bharucha as a welcoming gift to the newly arrived college President. Touched by the gift, President Bharucha visited the club to learn more about their projects. The discussion with the members naturally turned to geometry, and Dr. Bharucha—who has a multidisciplinary background in music, psychology, and neuroscience—expressed that his personal object of fascination for some time had been the torus—a kind of donut shaped form generated by revolving a circle in three dimensional space around an axis coplanar with the circle. The origami torus created for the President. The torus, President Bharucha explained, has various functions in musical theory. A four-dimensional torus, in particular, is the only form that can map the relationships of keys comprising the circle of fifths—relating its parallel and relative minors as well as the neighboring keys in a visually accurate way. Inspired by their conversations and after some reading of musical theory, the origami club members set out to develop an origami model of the torus to present to the President. It was a big project that took the group over a month to conceive and construct, requiring special care on the coloring of the modular pieces (to match the representative musical keys) as well as the overall construction of the thing itself. The group surprised the President by presenting him with the structure at a recent lecture he delivered on music and the brain. The origami torus now rests comfortably with the President in the Foundation Building, a prized possession in his seventh floor office. Ms. Nguyen, having just completed the last of her origami club meetings for the 2012 spring semester, says she plans to reconvene the club in the fall. This time she hopes to attract more members from the schools of art and architecture, who have not been as quick to join as students from the school of engineering. Origami, she says, is something she hopes students from all different backgrounds can rally around. For more information about the origami club or to get involved, contact nguyen6@cooper.edu.